The evolution of the market of payment services is accelerating at high speed, driven by continuous technological innovation and by the significant current legislative changes, that are reshaping the rules of the market. 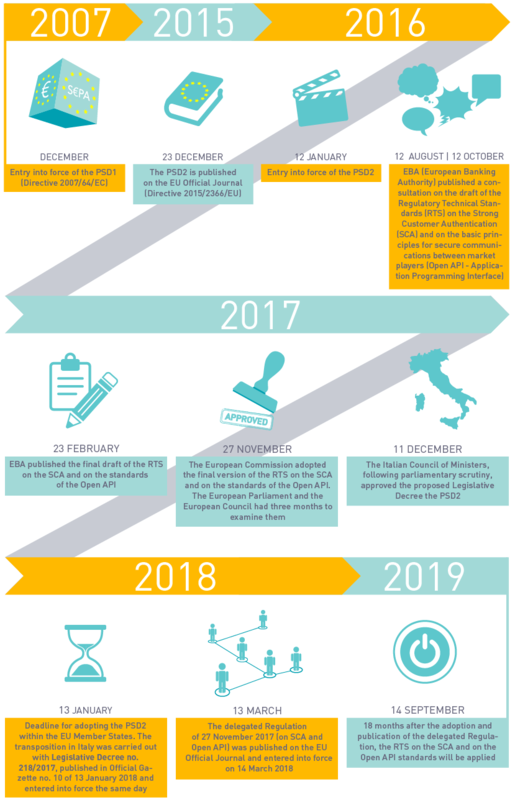 In order to increase pan-European competition by extending its validity even to non-bank parties and, at the same time, to harmonise the rules to ensure the safety of consumers, in 2007 the first Payments Service Directive (PSD) was adopted. It had in fact provided for the introduction of a regulatory framework for the SEPA (Single Euro Payments Area) concerning payments within the European area. Over the past decade, since the entry into force of the PSD, the evolution in digital technologies and the entry of new operators from the Fintech world in the financial sector have identified the urgency for a review and definition of the PSD in the light of the new scenarios considered as “out of scope” in the initial legislation.